Your nose looks the way it does thanks, in part, to the climate where your ancient ancestors lived, finds new research. The human nose conditions the temperature and humidity of the air we breathe, so it is not a stretch to imagine that environment and natural selection may have played a hand in guiding its evolution in different populations, much like skin colour. The researchers, led by Arslan Zaidi from Pennsylvania State University, collected over 2,500 3D scans of noses from around the world. Using these scans, the researchers calculated a range of measures to define nose shapes. They also collected genetic and self-reported ancestry data. The different nose measurements used in the study. From Zaidi et al. (2017). Why would nose shape be related to climate? Drawing on previous research, the researchers suggest that narrower nostrils my increase the turbulence of the air inhaled making it warmer and moister by the time it reaches the lungs – decreasing the risk of infection. They also touch on the “highly speculative” theory that the shape of the human nose may play a role in the cooling of blood flowing to the brain, as documented in reindeer and horses. This debated theory was beyond the scope of the study, but the authors acknowledge it as another possible factor in the interplay between climate and the evolution of noses. 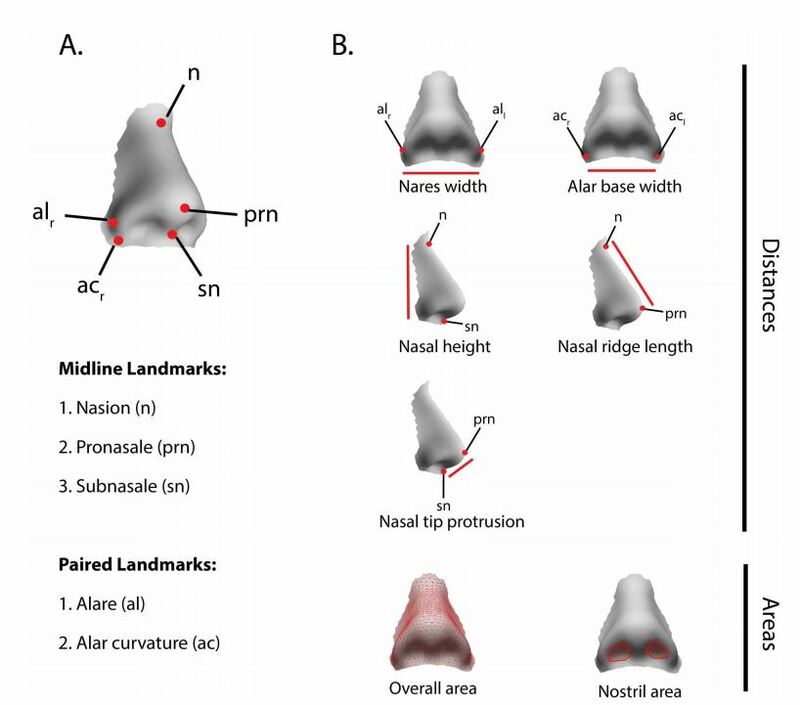 “The investigation of nose shape evolution with respect to climate adaptation, while interesting anthropologically, is also relevant medically. As humans are becoming more of a global community, the study of local adaptation is becoming more important to understanding health risks involved in living in ‘foreign’ climates. “Obvious examples of such health risks are of increased risk of sunburn, skin cancer, and folate deficiency in light-skinned individuals exposed to high UVB, and of low birth weight and chronic mountain sickness associated with hypoxia at high altitudes.